Now the Hero of Time isn’t the only one lucky enough to have a fairy companion! These little sprites are a new way to show off your Legend of Zelda fandom in style. 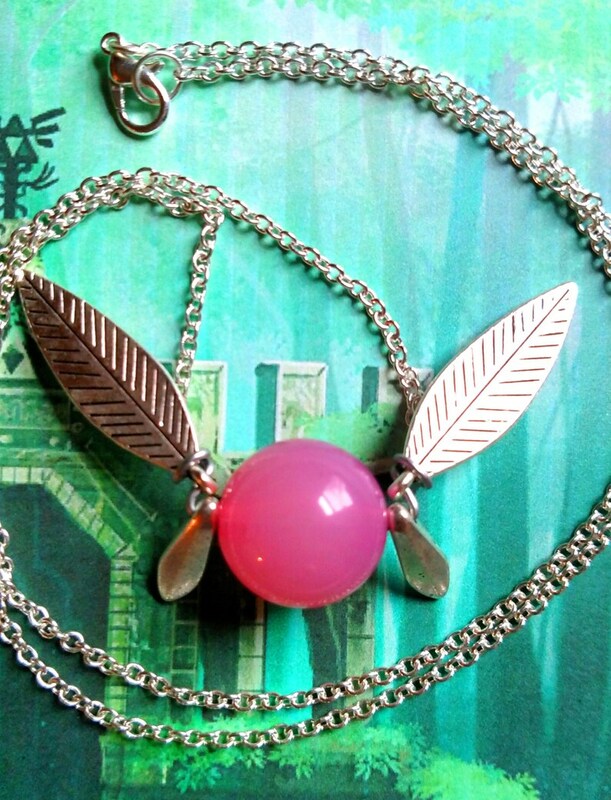 This particular necklace is based off common healing fairies found throughout the Zelda series. Each pendant has about a 2.5" wingspan, is made with an 18mm yellow acrylic bead and silver wings, and comes on a 22” silver link chain. The lower wings are made from glass, so handle with care. 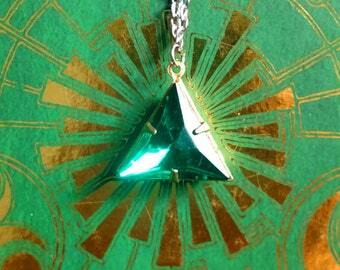 These necklaces now come with acrylic beads, so the chance of them fracturing for any reason is minimal. If you have any questions or requests, please feel free to message me! 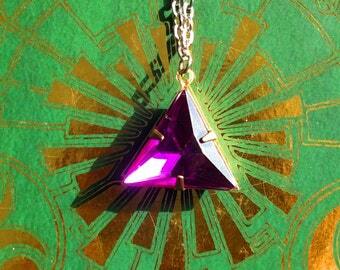 Hylian Crafts does not assume any rights to the intellectual property inspiring the item above. The Legend of Zelda is a copyrighted trademark of Nintendo. All intellectual property affiliated with The Legend of Zelda is owned by Nintendo. Awesome to offer such a great deal, beautiful little piece. Got here super fast and are just beautiful! Thank you so much! Highly recommended! 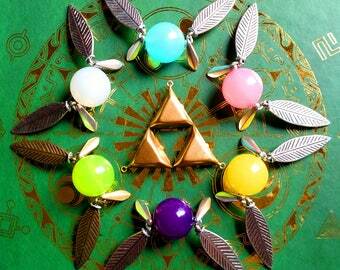 Hylian Crafts will accept payment only through credit cards or Paypal. I've had too much trouble with alternative forms of payment, so I'm sorry if this makes my store less accessible. A note about the listings: If you order one item and add a note that explains you would like another color, design, etc. of that product, I WILL NOT COMPLY. If you don't see the model you want, it is likely sold out and the stock will be replenished in a few days. EACH LISTING IS SEPARATE, so if you request a different color than the one you ordered, I will send the model you ordered. To comply with a request like that will mess with my account's records. TO REITERATE: you get what you paid for. I WILL NOT COMPLY WITH ANY POST-ORDER CHANGES. If you wish to cancel your order, please do it quickly. I usually print the shipping label as soon as I can after the order is placed. Otherwise, the label must be refunded. If you are dissatisfied with a full-priced product due to a malfunction or otherwise broken material, feel free to message me. You may send back your product, and either request a free-of-charge replacement or a full refund. Exchanges and refunds due to unfulfilled aesthetic satisfaction are also allowed, but return postage of the original item is both required and will not be provided by Hylian Crafts. If any order is returned to me due to shipping errors, I will be sure to contact you as soon as possible. If I receive no reply, I will automatically refund the payment after one week after the initial message has been sent. Each order is sent out with a tracking number. If the tracking information says the package has been delivered, no refunds or replacements will be provided for the buyer, as a cautionary measure for my store. The package at that point is your responsibility. Any items on clearance will be sent to the buyer as-is. No requests for alterations will be accepted. All sales regarding items on clearance are final-- no refunds, no replacements. Let the buyer beware. As best as I can, I will try to send out any orders placed before 1:30 PM CST in the same business day. Any orders placed afterwards will be sent out the next business day. Each orderwill be sent out in a 4.5x6" padded envelope (unless the order exceeds that size), and the item(s) will be placed on individual tags. Each package will be sent out with a tracking number. If any package is returned to me due to an incorrect address submitted by the buyer, he/she/they will be required to pay for the cost of sending another package to the correct address. If the buyer does not purchase said shipping within one week of the last correspondence with Hylian Crafts, the order's payment will be refunded minus the cost of the shipping. See below for more details on refunds. Please pardon the international rates-- if I could fix them, I would. Customer satisfaction is my #1 priority. Please, don't hesitate to contact me if there is something wrong with your product. I will do all in my power to fix whatever problems you may have within 90 days of your purchase. I take pride in my craftsmanship and accessibility. But at the same time, please take care with what you're ordering, and please read the item's description beforehand. I can only help if the problem was caused by my own errors. See shipping policies for more details. Hylian Crafts is no longer taking requests for custom items. I will not relay private messages to gift recipients of any purchased item. It is not personal or in the purchaser's handwriting, and it makes me feel weird. In short, Hylian Crafts does not have a greeting card service attached. Please contact me via Etsy's messaging system if you have any further questions or concerns. Do not contact me via my personal email. I find this gesture akin to walking up to a person's home address, knocking on their door, and demanding things from them off business hours.